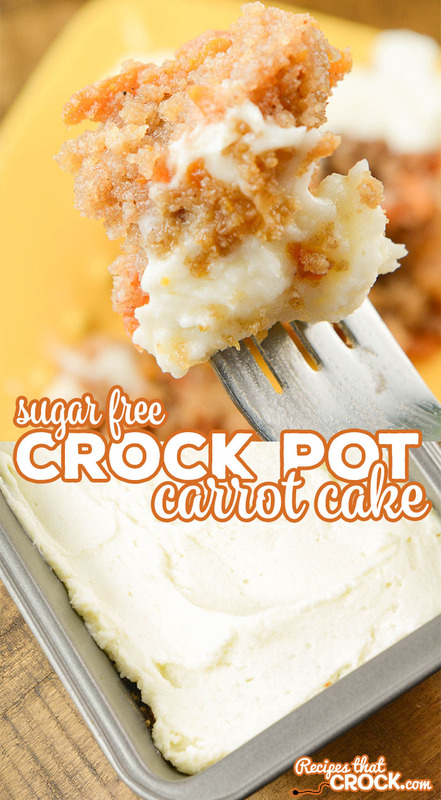 Sugar Free Crock Pot Carrot Cake (Low Carb) - Recipes That Crock! 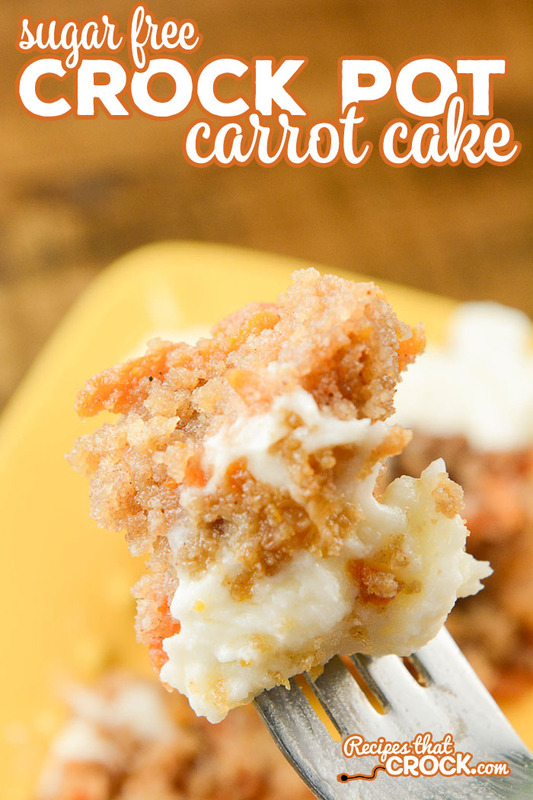 Do you love Carrot Cake but need a sugar free alternative? Our Sugar Free Crock Pot Carrot Cake is low carb and absolutely decadent. The sugar free cream cheese frosting is the perfect topping for this moist and delicate cake. Miss Add and I are HUGE Carrot Cake fans. When given our druthers, we always choose carrot cake. Since Miss Add has been old enough to vocalize her preference for birthday cake flavor, we have ALWAYS had carrot cake cupcakes especially for her –the birthday girl– while her guests would oftentimes choose chocolate cake instead ;). 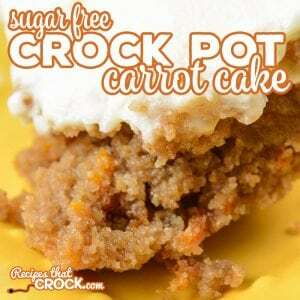 So, when I saw a sugar free crock pot carrot cake in one of my favorite low carb cookbooks, I KNEW I had to try it. I also KNEW it would have to be good in order for Miss Add to even begin to accept a sugar free version as carrot cake. You. Guys. HOME RUN. I combined the cake recipe (with a minor adaptation) with my own cream cheese icing recipe (altered to be low carb) and it was AH-MAZING. Miss Add gave it two thumbs WAY up AND even said she wanted it as an option at her next birthday. The cake portion of this recipe was adapted from one found in Easy Ketogenic Diet Slow Cooking (one of my favorite low carb cookbooks). The icing for this recipe is VERY sweet, especially combined with the cake. If you would like a lighter tasting version, omit the icing and serve with a dollop of whipped cream instead. This recipe was intentionally made to be sugar free and low carb. I have not tried substituting sugar and flour in this recipe so I cannot predict how those substitutions would effect the quality of the final result. We use a loaf pan inside our 6 quart slow cooker to create a smaller cooking vessel, prevent burning and uneven cooking. In a mixing bowl, combine butter, sugar substitute, eggs, heavy cream and vanilla with a mixer until blended. In a separate bowl, combine dry ingredients (almond flour, baking powder, baking soda and spices until blended well. Combine wet and dry ingredients until blended well and stir in carrots. Pour mixture into the loaf pan and place pan into a 6 quart slow cooker. Cook on low for 4-5 hours or until a tooth pick comes out clean. Cake will be very moist. Cool cake completely and then top with frosting and divide into 8 pieces. In a mixer, blend cream cheese, butter, extract and powdered sugar substitute until frosting forms. Made this for Easter dessert for my diabetic mom. This is a new family favorite! I am so happy to hear you guys enjoyed it!! So sorry, I meant can I make this in a loaf pan in the oven instead of crock pot? I am sure you could, but I haven’t tested it in the oven so I don’t have a temp/time to share. Enjoy! Can you do this in a cake pan? We have always used a loaf pan. If you try a cake pan, it may change cooking time (just like in the oven). Let us know how it goes! I’m newly diagnosed with type 2. Still learning to count carbs. Is it possible to know how many total carbs are in this recipe ? It does look mouth-watering! I’m not fond of cake in general, but am crazy about carrot cake. Thanks a million for a sugar free, low carb version. Pinned til I can make it! Do you put a little water in the bottom of the crockpot? I did not, but I have when baking other baked goods. If you choose too, just make sure to use a cup or less. Enjoy! How could you substitute the almond flour? Could you use carbquick? If so what would the measurement be? I haven’t tested anything other than almond flour. If you try something else, I’d love to hear how it goes. Enjoy! Thank you for the yummy low carb recipes . This carrot cake looks awesome! Can’t wait to cook/bake up some of you receipes! Carrot cake is one of my favorites. .going to check out more of your recipes too! !